Air Raid from Gothenburg in Sweden were formed in 2009 by guitarist Andreas Johansson. After a two-track demo in 2011 and CD EP called »Danger Ahead«, the band’s debut album »Night Of The Axe« saw the light of day in 2012, followed by the critically acclaimed »Point Of Impact« record for the High Roller label. Along with similar acts such as Ambush, Black Trip, Bullet and Robert Pehrsson’s Humbucker, Air Raid are hailed as one of the most accomplished protagonists of the new wave of traditional Swedish heavy metal. A nice thing to say. But now it’s time to move to the brand new album »Point Of Impact«. It always is kind of a cliché, but »Across The Line« is without doubt the band’s best effort by far... “Thanks alot for the kind words, man!,” says the guitarist. “First of all, we have two new members in the band as mentioned, Magnus Mild (on guitar) and Fredrik Werner (on vocals). I would say »Across The Line« is more guitar-oriented than our previous release. It's really packed with screaming solos and riffs. We always had lots of guitar leads, but we took it one step further. The overall feel of the album is melodic but with a very powerful edge. It comes natural for us to blend in neo-classical elements along with the ususal heavy metal, so that’s another significant thing on this record. The production values of the new album are very much superior to what the band has done in the past. Especially the guitars sound so full-on. 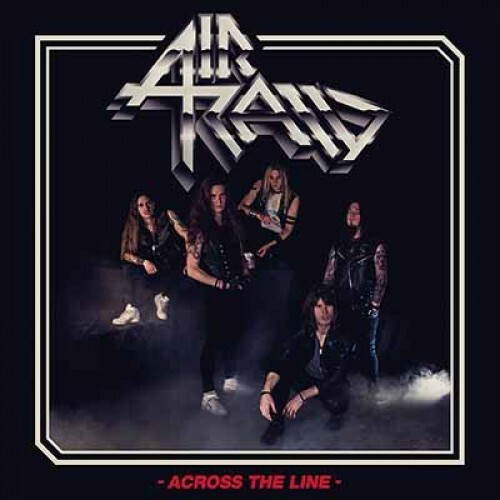 I think all in all »Across The Line« might be a big step towards reaching the next level for Air Raid... “We are fortunate to have Magnus in the band,” is Andreas’ answer. “He is very skilled in how to get a great sound in the recording procedure.